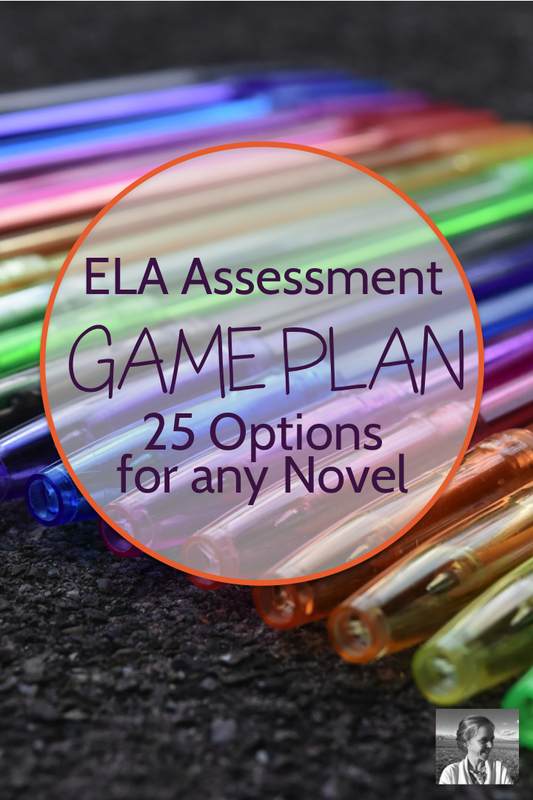 So you've finished a novel, and you want your students to practice writing. But you don't really need a five paragraph essay at this point in the year. 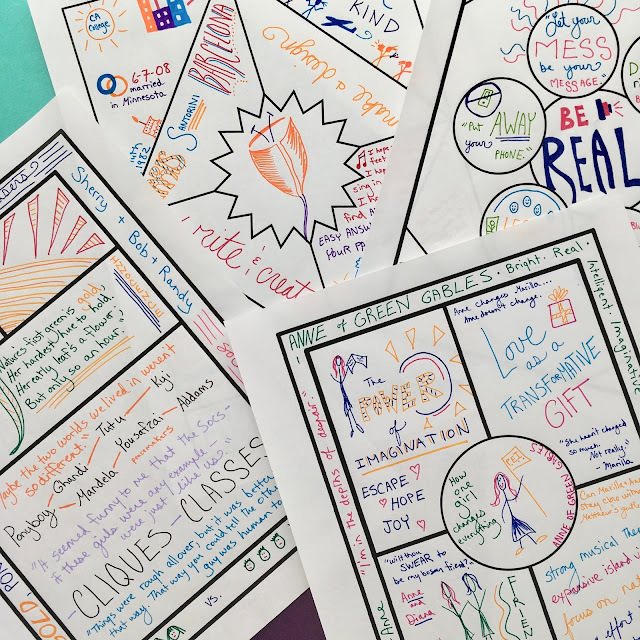 You want your students to practice their writing, but you want it to be creative and empowering, involving no busywork or hoops to jump through. Preferably, the assessment you're looking for would also be interesting to grade. Luckily, there are a MILLION options when it comes to creating an inspiring ELA assessment. Folks, we won the lottery here in ELA. Inspiration is everywhere! For example, flip the radio on on the way to work and you've got half a dozen assessment ideas. Students could create a playlist to match a character's experiences, host a literary podcast and bring on the author of the novel for a conversation, script a news interview between an NPR anchor and three literary characters around a theme from your current novel, write and perform a song about a character's development throughout the novel, curate a Ted show pulling together three existing Ted talks relating to a theme in the novel, or write the script for a call-in show in which characters from the novel call in for advice and discuss their problems with a host. For me, the important thing in designing these assessments is to have students explain the WHY behind the WHAT. This is what takes these assessments from fun little exercises in imagination to a real analysis and argument relating to a novel. For example, I might ask a student to create a food truck as if from the perspective of Starr in The Hate U Give. If the imagined truck just serves up food that Starr eats in the novel, with no particular theme or meaning, it's not a good project. Even if the title of the truck is super catchy, the colors coordinate, and the student cooks something tasty for the final showcase. On the other hand, if the goal of the proposed food truck is to enter communities, help them activate politically by giving people a safe place to talk and plan while eating menu items themed to revolutionary political thinkers, and all this is tied together with an argument based on key quotations from the novel in the explanatory write-up, this is a GREAT project. Even if the colors are a little off and the title is "Starr's Political Truck." Now in my ideal world, the artistry and details help to highlight the message and meaning. That's the best. But it's important as you design creative assessments to build in the language that will inspire students to make connections and arguments through their work. 1. Define and defend a road trip with at least five destinations for a literary character. Where would they go? Why? 5. 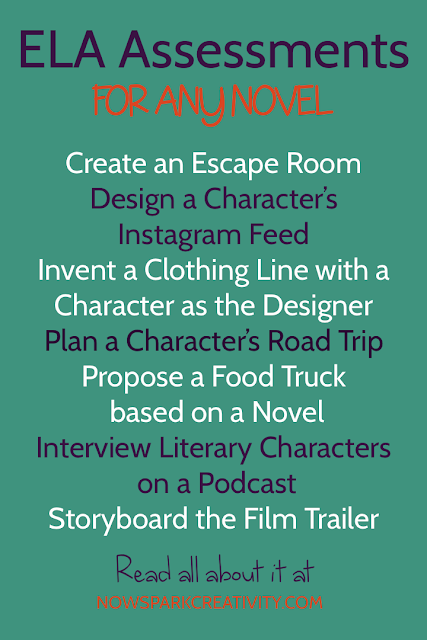 Imagine a literary character started a Kickstarter campaign - invent, describe, and explain its nature and purpose. 6. Create an escape room based on a novel and challenge another group or class section to escape from it. 7. Script and put on a one minute version of the play. Consider letting the class vote on awards for different performances - "clearest interpretation," "best depiction of a single character," etc. 8. 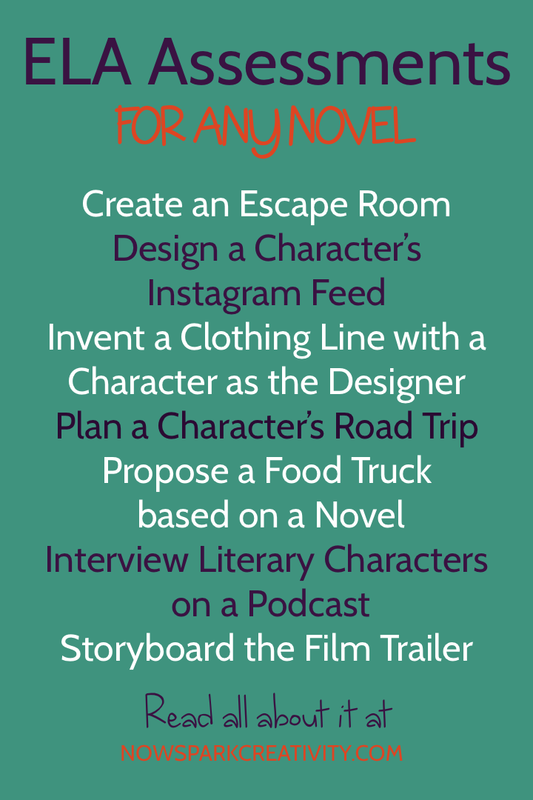 Create an Instagram account for a character in the novel, complete with extended captions and hashtags. 9. Script a dinner party between important characters from the novel, discussing at least three of the most important themes from the novel. 10. Create a podcast based on an important theme in a novel, including an interview with a character. 11. Start a Youtube channel for a character - would Austen's Emma start a channel giving love advice? Would Hinton's Ponyboy start a channel about how to prevent bullying? 12. Create a graphic novel version of your favorite part of the novel. 13. Storyboard a trailer for a film version of a novel. 14. Write a script proposal for a t.v. series inspired by a novel. 15. Put on a play version of a text and invite local guests. 16. Have students create artistic pieces inspired by a text and showcase them in a gallery. 17. In groups, create literary murals based on a text. Vote on the best and work as a class to paint it somewhere on campus. 18. Design one-pagers inspired by a text, poetry unit, podcast, or film. 19. Write and then submit an essay or creative piece based on the text to a writing contest. 20. Create a playlist for one character during the novel, matching songs with experiences, moods, thoughts, goals, etc. 21. Design one character's dream house. What makes it so perfect for them? Base all your choices on evidence from the text. 22. Imagine a character became the host of a television show. What would it be about? Who would come on? Why? 23. Using a phone camera, take a series of ten photographs to represent the themes of the novel. Defend your choices. 24. From the perspective of a character, write a letter to the editor of The New York Times based on an article in this week's paper. What would your character think about a key issue in the world today? Why? 25. Write a conversation between yourself and a character, debating one of the choices they make in the text. What did you question about their actions? Why? How would they defend their decisions? Imagine your character had a chance to address your high school at graduation. What would they say? Design an app that the character of your choice might invent. What does the app do? Why would your character invent it? What problem would it solve and why would your character care? Don't be afraid to take a chance and try a creative assessment. Just remember to build in the question of the WHY behind the WHAT, and create a helpful rubric for yourself so that you can keep your grading mainly focused on the clarity of the student's purpose and arguments, while still applauding their artistry and creativity. Now, I know this is a big list. I thought it might be more convenient for you if you could download a free PDF of all these to save on your computer or print out. So feel free to sign up below and I'll send one along! It will be my first message to you, and after that you'll get teaching ideas and web highlights from me on Fridays. Hi Betsy--I have a sincere question about some of these ideas (1,2,3,4,5,8,9, for example). I have a bias toward real-world tasks and, while I think some students might enjoy these tasks, I can't see their value. What is your aim in this types of assessment? I'm also interested in whether or not you ever have students who just reject these types of tasks. I think I would certainly have been tempted to as a student. Are their options for kids who don't connect to inserting literary characters into social media, for example? Such a relevant question! I have found that students can practice effective writing with a huge range of tasks. 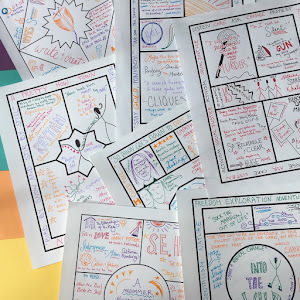 When a student designs a road trip for a literary character, for example, they need to dig into the characterization and make real connections between the world we live in and the details the author shares about that character's personality and development. I love real world tasks as well, and am a big proponent of passion projects and getting students going on things like letters to the editor, blogging, and design thinking. However, a great deal of our classroom work tends to spring out of the novels we read. I am always looking for ways to connect writing projects to modern life, because I think it helps the work feel more vibrant and relevant to students. Would your students who reject a social media assessment prefer to write a five paragraph essay? Does that feel more relevant for them? Nothing wrong with that! But as a writer myself, I don't end up writing many essays. I write a lot of social media captions, blog posts, list articles, personal narratives, project proposals, podcast scripts, e-mails, etc. Every once in a long while I get to write an extended essay for a magazine, but a lot more people read my other work than those. In the end, what I'm looking for are ways to make writing feel exciting and interesting to students, with a clear focus on diving deep into the novel and expressing their understanding creatively. There are a million ways to do it! I'd never recommend you use one that feels inauthentic to you or to your students. But I think there is lots of room out there to experiment.